The home side has played 4 matches so far this season. They have won twice, and lost only once. In its last match, Sapporo did well to snag a point away at Omiya Ardija, who was playing in the top flight just last season. Meanwhile, the away team has also played 4 matches so far this season. After winning on opening day, they have been winless since, losing twice. 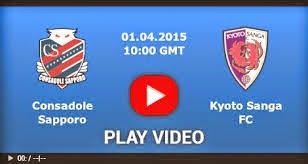 Only downside is Sapporo hasn't won any of the last 5 meetings between the 2 clubs.